Amazing sometimes canvases can be seen from the most famous painters. Vrubel with his mystical canvases, Savrasov, Kuindzhi, who conjured with his light on his canvases and thus made people believe that this is not a canvas of a picture, but a real live picture. That’s what he achieved mastery. And what about Levitan? He was a master of landscapes. His canvas is mostly landscape sketches. Here and on this canvas, the artist noticed one detail of a summer evening. This is when the sun is already hiding behind the horizon and the shadow of the night, a dark shadow, falls to the ground and slowly crawls along it blackening everything around. Never noticed such a thing? Well, in the city it is rarely seen, but on such spaces as on the canvas, you can see it often. Yes, almost every summer evening. If to fantasize, then these gates as if let out the sun and let in the night, which brings calm and coolness. The gates are open – go out the day and hello the night! Even the forest on the horizon is gradually sinking into the shade, and small clouds have appeared in the sky, which are unlikely to spawn out of the rain, but will blow cool. So at night it will be chilly. But it’s not scary, because the summer night is short – it gets dark late – it dawns early. So if it is cool and chilly, you will not catch a cold. Yes, and fragrant hay will not let you get cold. Oh, how to sleep well in a hay bale on a large spacious field, in complete silence! This hay is not on the canvas, but you can also assume. The road is dusty, the distant road led off the day, so that later it could lead to us again. And so from year to year, every day. 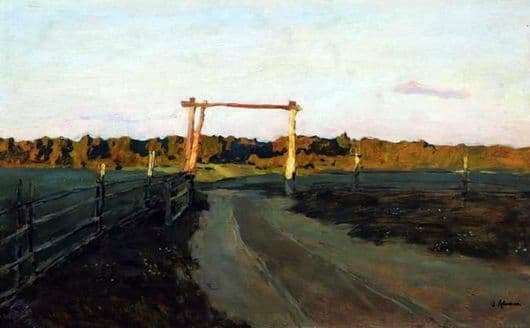 Cloth Levitan does not cause any anxiety or sadness, perhaps only nostalgia for the summer winter evening will cause this canvas. And then it will be thought looking at the picture: “Farewell to summer! Hello, autumn!”. And then here also through this gate and autumn the rains left, and Winter came.